It’s known as the “Gateway to Death Valley,” but Shoshone, California is more than a place to pause on your way to the national park. 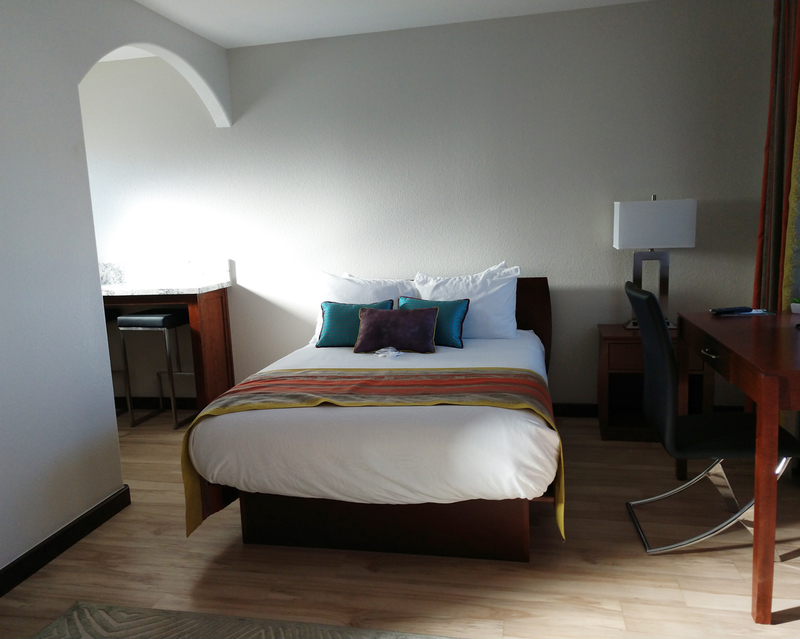 A museum, restaurant, and luxurious newly remodeled inn make it a destination in its own right. There’s a gas station, store, and RV park, too. Like other destinations in the eastern Mojave, Shoshone is most welcoming during fall, winter, and spring. That means you’ve got about eight more weeks to enjoy temperate weather while enjoying Shoshone’s colorful history and natural attractions. Shoshone is a ninety-minute drive from Las Vegas, making it a great day trip and an easy destination for a weekend getaway. Click here for a Custom Map showing the recommended route for this scenic trip. 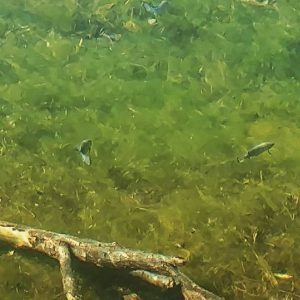 Shoshone Pupfish alive and thriving in six pools! The Crowbar: The Crowbar is Shoshone’s watering hole and restaurant, open every day from 8:00 a.m. to 9:30 p.m. It’s nearly a century old and a gathering place for locals and visitors alike. If you’re lucky, you might get to enjoy live music on the patio. The Shoshone Inn: Recently remodeled and updated, the Shoshone Inn is an oasis of understated luxury. Some rooms have kitchenettes, and all offer amenities like flat-screen TVs, wi-fi, super-comfortable beds and pillows, and designer touches. Guests can also use the nearby swimming pool, which is fed by natural hot springs. In the morning, make coffee in your room, or head to the reception lounge to enjoy some along with pastries and fruit. RV Park and Tent Campground: Free wi-fi is provided to both RVers and tent campers. In addition, tent campers have access to bathrooms, laundry, showers, and a library. Primitive campsites away from the main tent campground are also available. The Black Rock cabin has a fully equipped kitchen and accommodations for four. Charles Brown Gift Shop: Located across from the museum, the shop features Native American jewelry and supplies for road trips. Shoshone Airport has a paved 2400-foot runway and night lights. Small planes frequently fly in for the day. 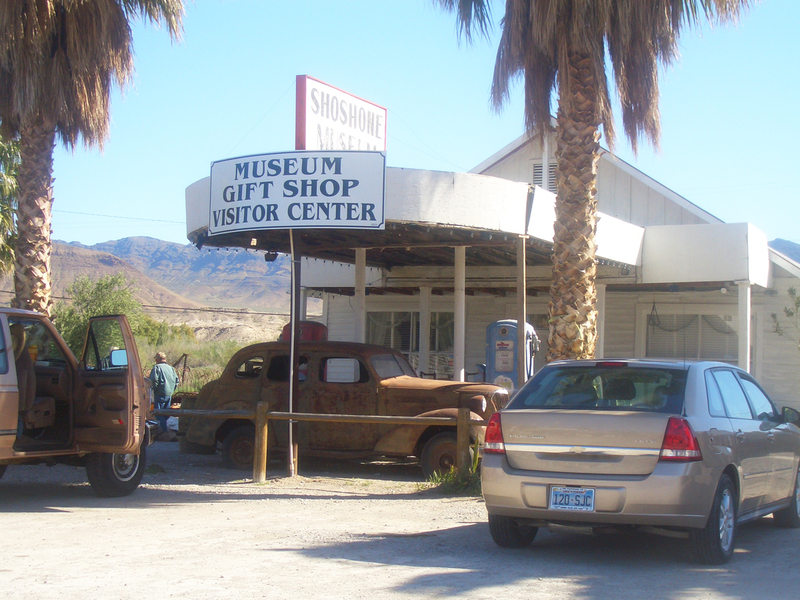 The Shoshone Museum: This tiny gem, housed charmingly in a vintage gas station, provides an overview of Shoshone’s mining history, natural history, flora, and fauna. The museum hosts talks and events—usually on weekends—that are open to the public. The museum’s store has a wonderfully curated selection of books about the area along with gifts, toys, souvenirs, and artwork. Admission is free; donations gladly accepted. Dublin Gulch: Just outside the village to the south, you can explore the caves where miners lived in the 19th and 20th centuries. It’s fascinating to peek inside these remarkable dwellings and imagine the hardscrabble lives those miners lived. 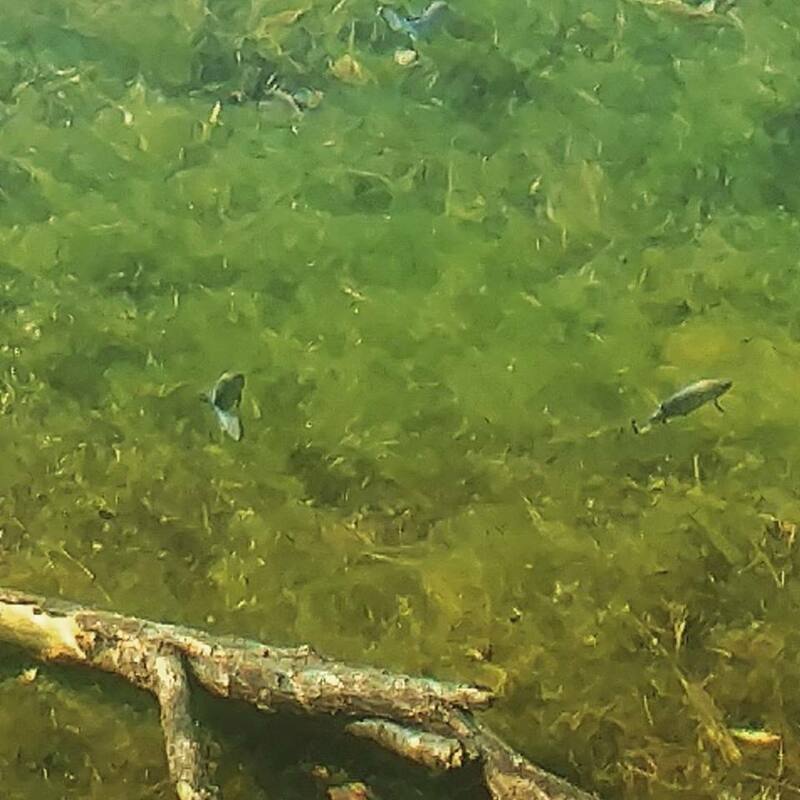 The Pupfish Pond and Shoshone Vole Habitat: Once on the verge of extinction, pupfish and Shoshone voles are emerging from endangerment thanks to the efforts of local landowners and advocates. Near the RV Park, a trail leads to the pond where pupfish, unique to this part of the Mojave Desert, now flourish. You’ll see work continuing on restoration to the habitat for Shoshone voles, whose numbers are now increasing. Because of the village’s proximity to the Shoshone wetlands, there are a number of birds and other animals making this area a popular place for birders and other naturalists. Tecopa: Get yourself into hot water! 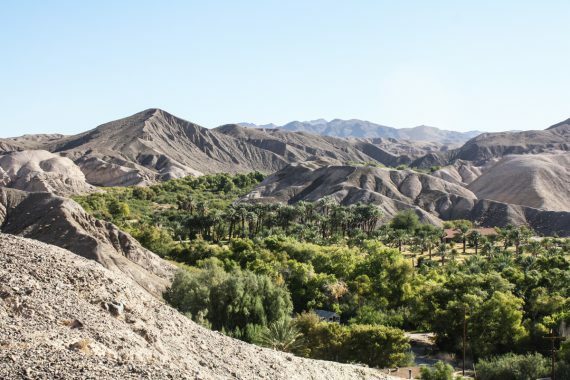 Fabulous hot mineral springs are Tecopa’s claim to fame. You can “take the waters” at the Tecopa Resort or at Delight’s. The Bistro at the resort serves breakfast, lunch, and dinner. Nearby, the Tecopa Brewing Company serves up delicious barbecue on the weekends, often accompanied by live music. If you go, you have to try the barbeque brisket! And, in this article, local author and journalist, Robin Flinchum provides an overview of the culinary treats to be found in the Tecopa area. China Ranch Date Farm: Follow a road reminiscent of old Hollywood westerns to get to China Ranch, where date palms have flourished for a century. Stop in to the gift shop for a date shake and to browse a wonderful display of artwork, gifts, books, and delicious things to eat, including fresh baked goods and dates of many varieties from the ranch. You can drive through the date orchard, too. 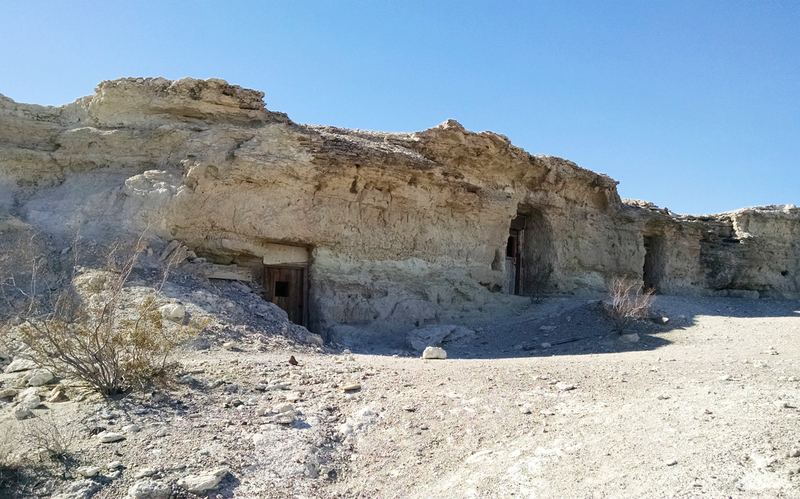 The Amargosa Canyon is a popular place for hikers and also train history buffs. In 1906-1907 railroad engineers for the Tonopah and Tidewater Railroad spent more than year building the short train track. These days, the road bed provides a primary hiking trail through the canyon. Much of the Amargosa River flows underground in the eastern Mojave but flows above ground in the canyon creating an environment for a variety of animals. Another incredible place to see is connected with the underground sections of the Amargosa River in the Ash Meadows National Wildlife Refuge. It’s located to the north and east of Shoshone and is the largest remaining oasis in the Mojave Desert. There are boardwalks for exploring the springs, and you’ll find Devils Hole—home of the unique Devils Hole pupfish—here, too. Devils Hole is approximately 500 feet deep, an estimate because divers have yet to find the bottom! Death Valley National Park: Yes, Shoshone is the “Gateway to Death Valley.” Consider making Shoshone Village your base camp for exploring the national park. By day, you can enjoy the vista from Dante’s View, marvel at the salt flats of Badwater, or even drive Titus Canyon. At night, relax in Shoshone’s quiet village atmosphere and share stories around the campfire at the Shoshone Inn. Thanks for all the info. I didn’t realize Shoshone had so much to offer. Makes me want to make an overnight of a trip to Death Valley. Thanks to so much interesting information, until recently I didn’t know that Shoshone has so much to offer, but a friend told me recently that it was and really is worth it.